What do you say when you want to say that the food in the pot was overcooked and something like the picture above happened to the pot? Also, is there any specific term for those black stuff on the bottom of the pot or pan? This can happen when the moisture in the food has disappeared and the food is left to continue to cook, it can also happen if what's being cooked is very dense and heavy with the heat level used being too high. If it was an accident, then what you have could be called "scorched food burnt to the bottom of the pan". Partially burn so as to blacken the surface. The food has stuck to the bottom of the pan. The food is burnt on (or burned on). The food is probably burnt and you call that pan a scorched pan that requires extra efforts to clean it. However, there could be many ways to tell that. However, it is important to note that not all overcooked food is burnt! This picture is definitely just 'char' that's been 'burnt', although your use of the Persian word suggests you're also curious about the better kinds of burnt rice. The usual verb for this would be 'cooking' the rice, if most of it came out OK. A little char at the bottom is very common for rice cooked in a pot rather than a dedicated rice-cooker and is usually just ignored. 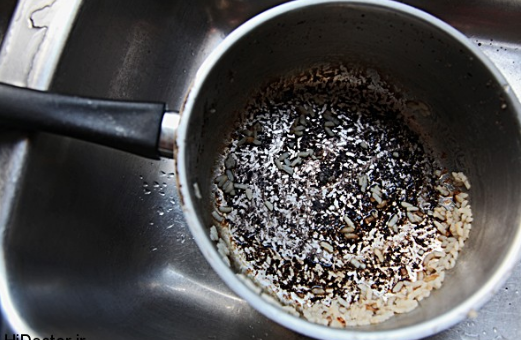 If you intentionally burnt the bottom layer of rice as part of your dish, you might call it 'scorching', 'charring', 'toasting', or 'searing' that bit. They're usually synonyms for 'intentionally burning food for effect' but if you wanted to distinguish them, 'scorch' (superficially burn) and 'toast' (brown by exposing to fire) are somewhat more etymologically accurate than 'char' (carbonize) or 'sear' (cauterize). If you wanted to bemoan the wasted rice, you'd just go with 'burning the bottom' (i.e. of the rice, not the pot). All the other words are variations of 'burn', but in relation to food the base idea is associated with doing it mistakenly and to bad effect. 'Burning the rice' would imply most of the rice is getting binned. You're Persian? You'd just call it 'tahdig' and then explain that it's an Iranian delicacy made with... Well, you can just call it 'burnt rice' if you like and they'll roll with it. It's your culture, their language, and who are they to not at least try it? If you're trying to sell it to a distrustful foodie, just use those nicer words from before: 'scorched rice', 'charred rice', 'toasted rice', 'seared rice'. 'Browned rice' could also work but is easily confused with 'brown rice'. There's a laundry list of foreign terms for variants of tahdig at Wikipedia's article on scorched rice. You could use them if you were cooking other food from the same cuisine. 'Socarrat' is more common than the rest since it's part of making paella. If you were the dishwasher instead of the cook, though, you'd complain about having to deal with the 'char' (or any of several dozen synonyms of 'crud') when you went to clean the rest of that burnt rice. I'm Australian, so there is likely some cultural variation. Personally, I'd call it "burnt", or more specifically "a burnt pot". Others have mentioned "charred" or "scorched". Whilst in Australia people would most likely understand what you meant, I have never heard either of those terms used in conversation to describe this, always just "burnt". As others have noted, "overcooked" is not the same (it refers to food cooked beyond it's ideal state). FWIW it's also possible for food to "stick" to the bottom of the pan, without actually burning. This may result in the stuck bits becoming "overcooked" but if rescued in time (i.e. via vigorous stirring, preferably with a wooden spoon) may avoid them becoming "burnt". PS I use "burnt" as the past tense for "burn". AFAIK in American English only "burned" is the correct past tense, whereas in Australian English either is acceptable and I prefer "burnt". FYI Australian English has historically been closer to British English; although more recently has become more influenced by American English (I assume due to our consumption of North American media). While the food in the picture does look burnt, a similar concept in (American) english is 'fond' or 'sucs' (from French). The exact wording depends partly on the specifics of the food and how it came to be there. In most cases, the typical idiom is that 'the food has X on the bottom of the container', where 'X' is a verb in the past tense referring to the process that caused the food to end up in this state. If it was mostly sugary,, and the result is sticky or crystalline, then the food has carmelized on the bottom of the pot. This is most commonly the case for certain sauces, or for intermediate steps. Some non-sugary foods also carmelize (onions for example), though they rarely leave much residue. If the result is a hard black or brown powdery, crunchy, or just solid layer, then the food has burnt or charred (or if you want to get really technical, pyrolyzed) on the bottom of the pot. You can usually smell the slightly burnt food in this case, and if left too long on heat, this will eventually catch fire. If the result is simply a layer of the food dried and dehydrated, without being burnt or charred, then the food is caked, dried, or possibly even baked on the bottom of the pot. This is usually the result of letting something cool down too far, or just letting something sit out too long and dry out. In this general situation, where all of the water in the pan either has boiled away as steam or has been absorbed into the food, and the remaining food in the pan has started to scorch, it is common in American English to say that the pot has boiled dry. The burning of the food is not strictly required for a pan to have boiled dry--if one catches it after the liquid is gone but before it starts to burn, the term still applies. Is the black part of foods that got burning - called 'coal'? Using an idiom, how to describe a two-faced friend who speaks ill of you behind your back? How to describe this kind of “highlight” in a video?